Fort Worth Personal Injury Lawyer - Arlington, Texas Accident Attorney - The Eric Reyes Law Firm, P.C. The Eric Reyes Law Firm PC is a Texas personal injury law firm which specializes in representing the injured since 1988 in Fort Worth, Dallas as well as every major city in the state. 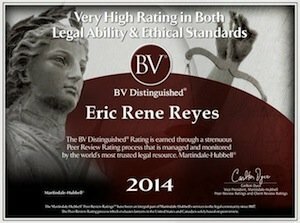 Fort Worth Dallas personal injury lawyer Eric Reyes is double board certified. He is Board Certified in Personal Injury Trial Law and Civil Law. Only 3% of all Texas attorneys are double board certified. "As the founder of this firm, I believe that every client deserves personalized service and aggressive representation regardless of the size of the client's claim. You will never get a bill for my legal services. Instead I receive a percentage of the settlement or the jury verdict. If you have no insurance to pay for your medical bills I can still help you. I work with a network of doctors who will treat you now and will agree to wait until your case settles before payment of their bills. This network includes exceptional medical doctors, chiropractors, orthopedic surgeons, hospitals, and pharmacies. My office for the past thirty years has represented victims of negligence arising from motor vehicle accidents, on the job injuries, falls in a store, medical malpractice, products liability claims, and other serious accidents. Also, I will never settle your claim without your expressed permission. Each client must approve a detailed accounting of the settlement offer before they grant me permission to settle their claim. In other words, the client must know the amount of the attorney fees, bills and what amount of money they will receive in their pocket before they decide to settle. Our office has represented victims injured in car wrecks, on the job injuries, falls, and other accidents in the Fort Worth , Bedford, Hurst, Dallas, Arlington area for the past 27 years. As a board certified specialist in personal injury and civil trial law, I am a highly trained specialist in injury law in Texas. Board certified attorneys must pass rigorous ethical and professional standards before the Texas State Board of Legal Specialization grants the attorney the privilege and honor of this certification. Don't settle for a less qualified attorney to handle your personal injury case. In addition to receiving professional awards and certifications, the Eric Reyes Law Firm has received an A+ rating by the Fort Worth and Dallas Better Business Bureau. On January 26, 2018, I was inducted into the Texas Bar College. The Texas Bar College is an honorary society of lawyers who possess both high ethical standards and improved education. The Texas Bar College recognizes Texas lawyers who attend twice as much Continuing Legal Education (CLE) training courses than is required by the State Bar of Texas. Essentially, The Texas Bar College recognizes and encourages lawyers to maintain and enhance their professional skills by participating in additional legal education doubled the amount than is required by Texas State Bar. Please browse this website for information regarding the areas of law that we practice. Please watch my videos where I share important information regarding your rights and the dangerous pitfalls to avoid in your personal injury claim. Also please watch on this web site CNN's award winning documentary "Auto Insurance" hosted by Anderson Cooper. This two part video explains how insurance companies place profit over the welfare of the injured. Remember, I, Eric Reyes will not collect a fee unless I recover a settlement which you must approve before your settlement. Call us today for a free consultation and appointment with a Fort Worth, Arlington and Dallas personal injury attorney or e-mail us from this web site"
"Based on my personal experience, I recommend Eric Reyes unequivocally. He proved an indefatigable advocate. His hard work resulted in a just and fair settlement. I cannot thank him enough."